Gilbert is in uniform, wearing a peaked forage cap parked at a jaunty angle upon his head. Tucked into the fold at the front of the cap is a white ‘flash’ of fabric. This flash was the mark of an airman under training. Gilbert’s serious expression and immaculate uniform coupled with the trainee flash suggests this might be a copy of his enlistment identity photograph. The photo was therefore most likely taken in late June 1942, when Gilbert would have been 26 years old. He barely looks out of his teens. 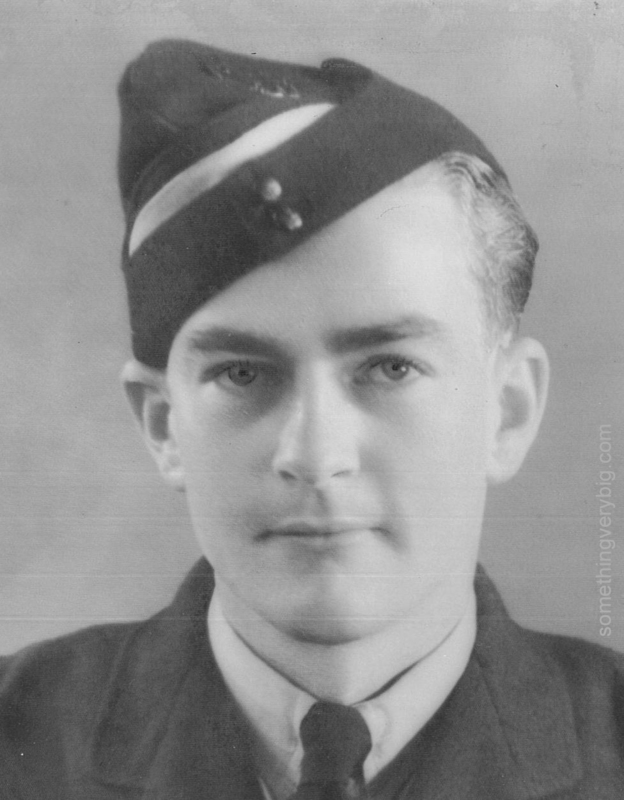 While not unique to Bomber Command itself, photographs of airmen from Commonwealth air forces in WWII will frequently show them wearing caps just like this one. The forage cap had been part of the uniform of the Royal Australian Air Force since the First World War. It was designed to look reasonably respectable even after being folded up and jammed into a corner in the cramped cockpit of an aeroplane. A battered cap was a sign that its owner was no sprog. In May 2009 I visited Lezennes on the anniversary of the Lille operation to see the graves of my great uncle and his crew. I wasn’t prepared for the reception I was given by the locals. There was a small but moving ceremony at the cemetery, presided over by the Mayor with perhaps 20 people attending. After the cemetery we walked into the town to the local library, where a display had been set up telling the story of the crew. There was a television camera crew to document the occasion. I even met a man who had been 10 at the time of the Lille raid, and who remembered standing next to the graves the day after the funerals, singing ‘God Save the King’. His name is Laurent Messiaen. 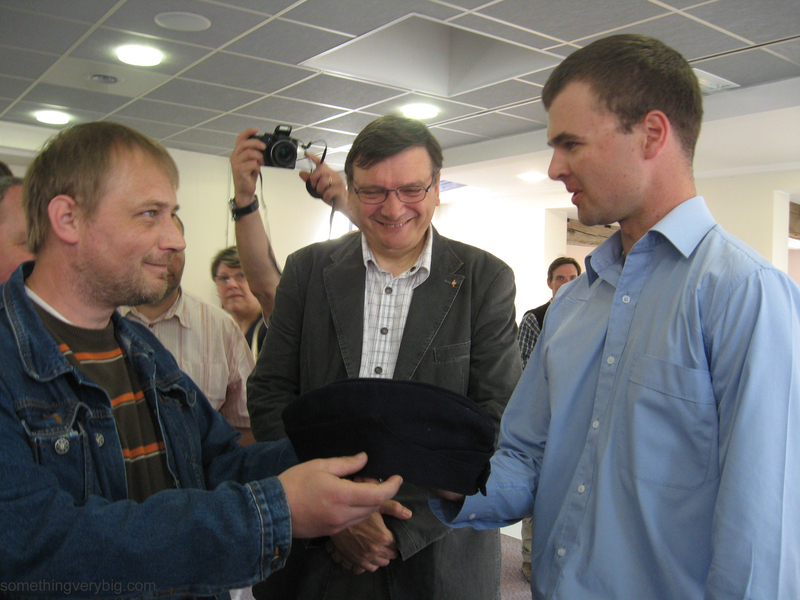 He is presenting me with a pristine original RAAF forage cap. The exact origins of the cap are unknown. I was told it had been with a local family since the war. Apparently Laurent read about my impending visit in the local newspaper and came along specifically to give it to me. There is no doubt that it is RAAF. Stamped inside, it says “MADE IN AUSTRALIA 1943”. A direct link with the Lille operation cannot be ruled out. The cap now sits on my shelf. It’s become one of my most treasured possessions. I have been searching the web to confirm what was the significance of the white ‘flash’ insert in RAF side caps in WW2. I have a photograph of my father (who was killed in the war) wearing his cap with this insert. Knowing for sure that it refers to an airman under training, I can now date the photograph! Thank you!